In his first year playing for Hawaii, guard Matt Lojeski is second on the team in scoring (13.5 ppg) and first in 3-pointers (27). A lot of young athletes might have been thrilled to have a professional scout stop by for a chat after a ballgame. For Matt Lojeski, an encounter with a Major League Baseball representative last summer didn't interest him much at all. Lojeski's father, Tom, had pulled his eldest son into duty when the 19-and-under baseball team he was coaching was left shorthanded for a game. And it didn't take long for the substitute center fielder to catch the eye of at least one spectator in the bleachers. "In the first inning, there's a ball hit to right-center with a runner on second," Tom Lojeski recalled. "He scoops it up and guns this guy at the plate. A scout from the Cleveland Indians comes up to him trying to figure out who he is because he wasn't on our roster. "Matt tells him, 'I'm on a basketball scholarship. If you want a good baseball player, there's my little brother over there. Go talk to him.' And he walks away." Though he spent most of his summers bouncing around diamonds throughout the Midwest with his father's traveling team, baseball couldn't match the allure of the court for Lojeski. By his junior year of high school, Lojeski had committed himself to hoops and embarked on a journey that took him from his Racine, Wis., home to a tiny town in rural Wyoming, to the middle of the Pacific, where he has emerged as one of the Hawaii basketball team's most consistent scorers this season. "It wasn't too much of a decision for me. Basketball was always in my heart," Lojeski said. "I loved basketball. Baseball was fun, but I couldn't get away from basketball." The strong right arm that caught the attention of the Indians scout last summer is now responsible for much of the Rainbow Warriors' perimeter scoring. Lojeski, a 6-foot-6 junior guard, is UH's second-leading scorer at 13.5 points per game and has made a team-high 27 3-pointers entering tomorrow's Western Athletic Conference game against Fresno State. 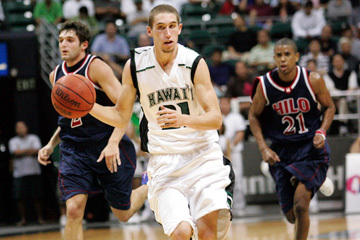 He has also been UH's most reliable free-throw shooter at 83.7 percent (36-for-43). Lojeski was an All-State pick in Wisconsin as a senior at St. Catherine's High School, while also earning all-conference honors in baseball. A 6-foot-2 prep standout, Lojeski grew 4 inches while enrolled at Eastern Wyoming College, where he played all five positions on his way to becoming an NJCAA third-team All-America pick last year. Going from Racine, located between two metropolitan centers, to Torrington, Wyo. (population 6,000), was a drastic change of scenery for Lojeski. But he didn't foresee just how far he'd travel to continue his collegiate basketball career. "It was a culture shock," Lojeski said. "(Racine is) between Chicago and Milwaukee, so there's tons of people, then I go to the middle of nowhere, basically isolated. "Before you know it, I'm talking to (UH associate coach Jackson) Wheeler. I didn't make too big of a deal about it until he came to watch me play and then I thought, 'He's pretty serious.' "
Lojeski chose to sign with UH over DePaul and Utah State. Upon joining the Rainbows, he worked at small forward behind senior Julian Sensley, but was later moved to shooting guard to take advantage of his shooting ability and court sense. Expectations rocketed when Lojeski began his Division I career by hitting six 3-pointers in a 20-point performance against then-No. 4 Michigan State in UH's season opener. The landmark win over the Spartans was particularly sweet for a player who grew up in Big Ten territory but didn't get much of a look from the more prominent programs in the area. "It meant a lot to him," Tom Lojeski said. "It was a Big Ten school, his first game in Hawaii, so he was really hyped up for that one." Following a disappointing return to his home state that left him with a sprained left shoulder in a loss to Wisconsin-Milwaukee, Lojeski bounced back to connect on eight of 11 shots in a WAC victory over Utah State. Through six games, he was shooting 62 percent from the field and ranked among the nation's top 3-point shooters (17-for-28). His numbers have since leveled off as opponents highlighted him in their scouting reports. Lojeski is now working to counter the defensive adjustments with a few of his own. "Coach is really getting on me to change my game a little bit," he said. "(Defenders are) jumping out on me. They know I want to shoot, so I need to work on getting to the hoop more, making different kinds of cuts off the ball, because I'm not just going to be able to stand there and shoot." UH head coach Riley Wallace would like to see Lojeski be a little quicker on his release as he curls behind screens and attack the rim with confidence. "He's got to shoot the ball when he's open and he's got to come off (the screen) with an attitude that 'I'm a scorer,' " Wallace said. "On his way to the end of the pick, he has to be thinking that. He thinks of his shot after he catches the ball and that's one or two counts too late. Our 2-guards have been a catch-and-shoot type. He's catch, look and shoot." Though devoted to baseball, Tom Lojeski is happy with Matt's choice of sports and is approaching the end of his coaching days. Matt's younger brother, David, is a high school senior who hopes to play college baseball next year. Matt played the middle infield positions as a youngster and was also a pitcher before he hurt his throwing arm. But judging by his play last summer, the injury hasn't had any lingering effects. "I threw my arm out, but it came back stronger," he said. "It's crazy, I can really throw it now."